Mevagissey is a working harbour located about 5 miles south from St Austell in Cornwall. 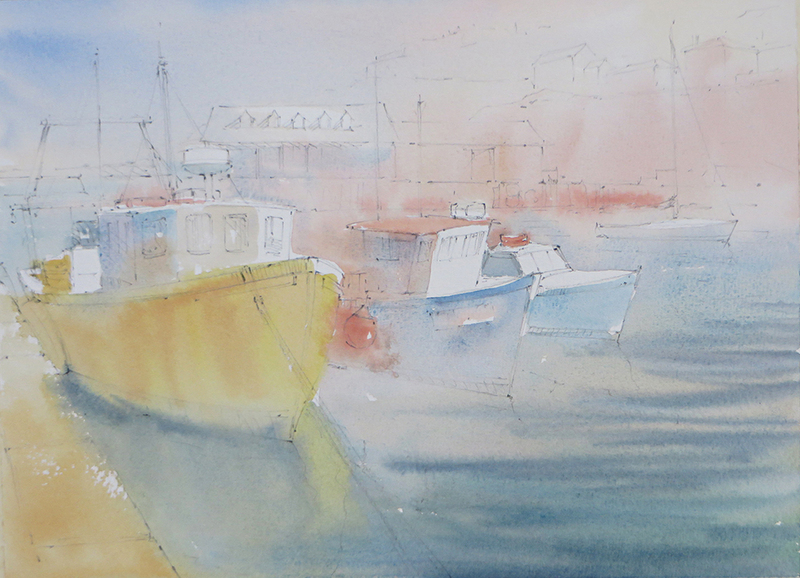 Walking around the quayside, this view across the harbour with colourful boats, hazy sunlight and interesting reflections caught my eye immediately. Saunders Waterford High White 140lb Rough. 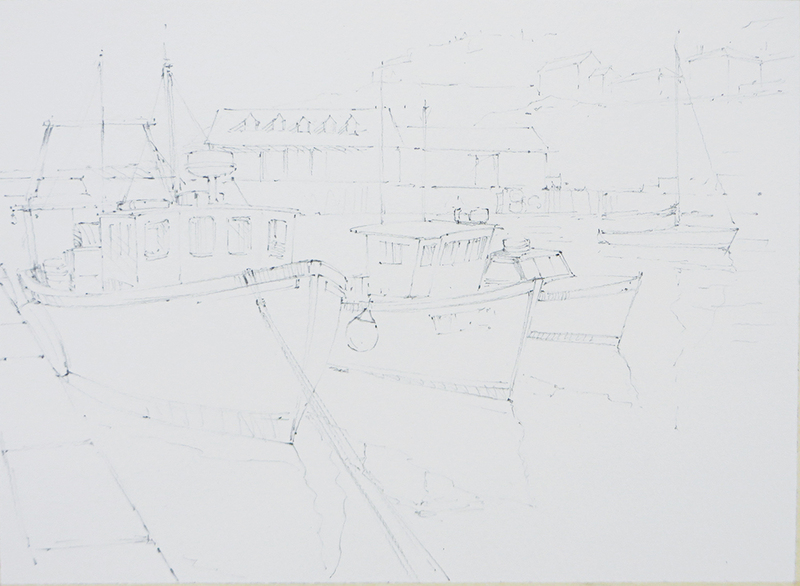 First I lightly sketched the composition onto the watercolour paper, using a 2B pencil. I liked the tonal contrast of the rusty yellow boat against the darker blue vessel, so made this my focal point. Next I established all the light tones of the scene with a wet-in-wet under wash, reserving bright white areas as untouched paper. Starting with the sky, I wet the paper and added Raw Sienna and a little Alizarin Crimson on the right where the sun was shining, followed by Cobalt Blue on the left. 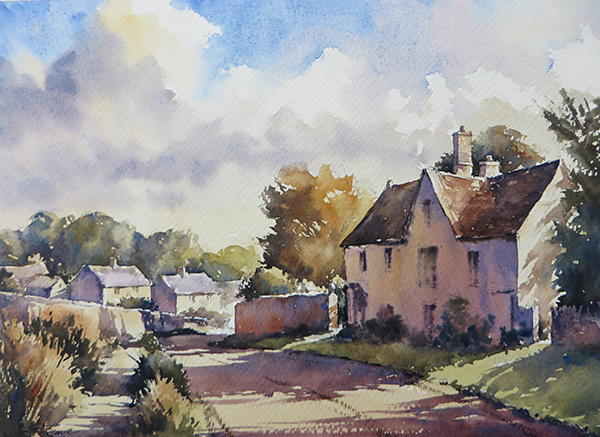 The sky wash was pulled across the buildings and the water, adding Cerulean, Viridian and a little Alizarin to develop the colours in the water. Ripples on the surface were painted with a thicker mix wet on wet. Vermillion was used for the floats, life rings and roof of the central boat, finishing with Raw Sienna, Cadmium Yellow and Burnt Sienna for the foreground boat and quayside. 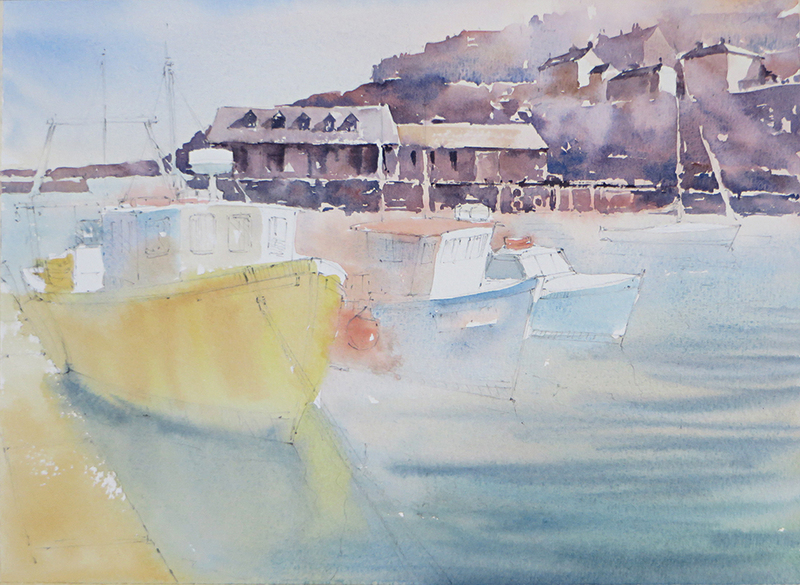 With the under wash dry, I worked from background to foreground, starting with the distant cottages and harbour buildings. 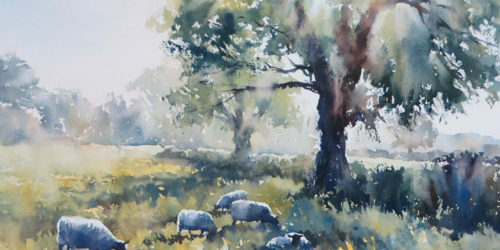 I wanted to capture the effects of the hazy sunshine, so I softened edges as I worked with clear water. 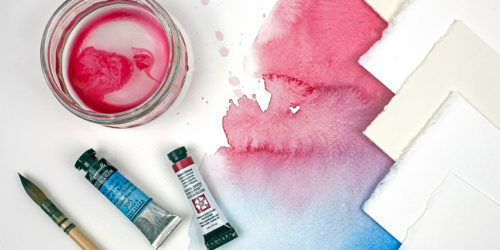 This backdrop was painted mainly with Cobalt Blue, Light Red and a little Burnt Sienna. 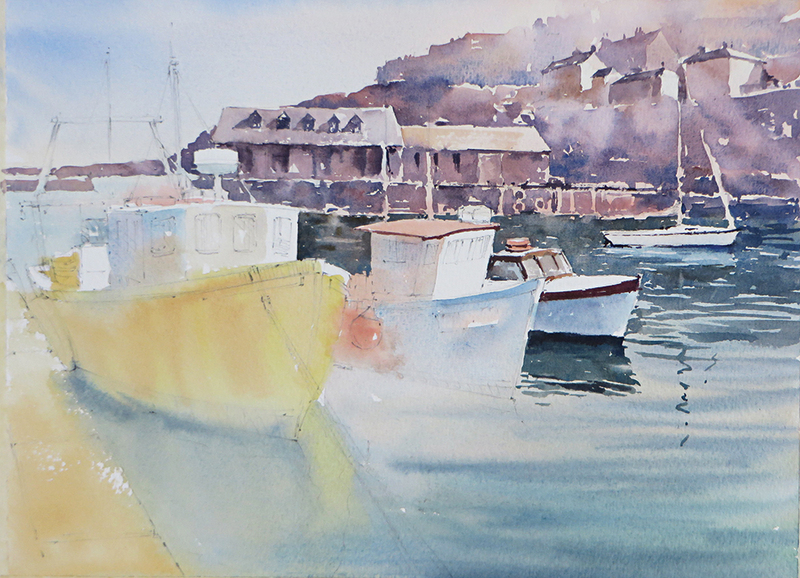 I then developed the reflections of these buildings which in turn defined the lighter tones of the boats. This illustrates how tonal contrast is so important in creating definition and a sense of light. The next step was to develop the boats. 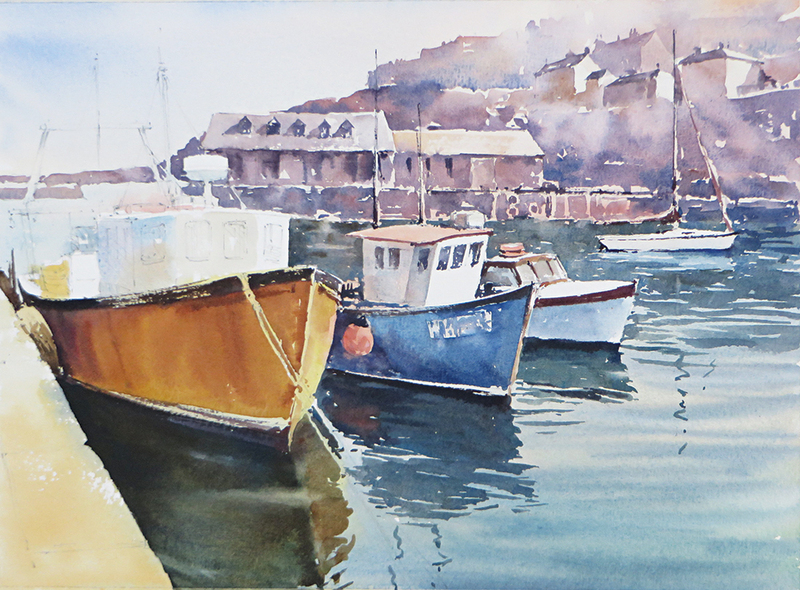 I used Cobalt Blue and Cerulean on the central vessels, with Cadmium Yellow and Burnt Sienna for the boat on the left. I used French Ultramarine and Burnt Sienna for the dark edges around the top and waterline on each boat. Before this was dry, I painted the reflections of the vessels so that they merged with the base of the boats. This helps the boat appear to sit in the water, rather than balance on top of it. 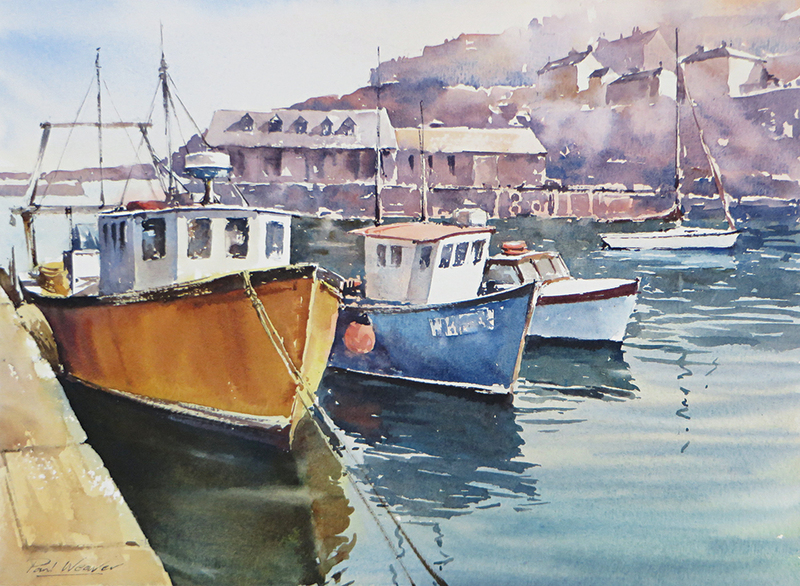 Finally, I added windows, ropes and other details to the foreground boat with mixes of blues and browns, finishing with the foreground quayside. I used Raw Sienna and a warm grey mixed from blues and browns, dry brushed to suggest the texture of the stone surface.